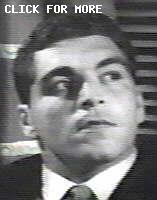 Bill Williams makes his final appearance on Perry Mason playing a losing football coach named Burt Payne. Burt and his wife, Ellen, own the Wildcats professional football team. Burt wants to sell his 10 percent ownership to a group of investors and even gets a down payment from them. However, Burt needs his wife�s approval, and she is not interested. After Ellen meets with one of the buyers aboard a train, Burt is apparently killed in an explosion. The episode climaxes with a chase scene filmed at the Los Angeles Coliseum. Perry actually runs as he and Paul pursue a shadowy figure who provides the key to the case. At 25 (in addition to the principal cast), this episode has the largest credited cast size of the series. Submitted by daveb, 5/1/2007. Near the end of the episode, Lt. Drumm stands at one of the exit tunnels watching Perry and Paul as the crowd files past him. Don Anderson, with his familiar hairstyle and the thick-rimmed spectacles he often wore in the later episodes, is just barely recognizable among the football fans. Submitted by FredK 21 April 2012. Richard Anderson appeared in 26 original Perrys (as Lt. Drumm, a state senate candidate & a corporate VP), "The New Perry Mason: TCOT Telltale Trunk," "PERRY MASON RETURNS," 5 Ironsides, 7 FBIs & a Wild, Wild West [IMDb]. Mike Bedard 2.14.15. It sounded like "Receptionist" Sue England was also the operator's voice at the beginning of 12th Wildcat. She was in 5 Perrys & voiced a "Female Robot"/"Space Control Officer" in "Lost In Space" & a "Woman's Voice" in "The Death Watch" episode of "Voyage To The Bottom Of The Sea" (Uncredited) [IMDb]. Mike Bedard 2.18.l5. There's something unusual about today's title....give up?? It's the only one of the 271 in which the subject is Perry himself; (Paul and Hamilton were also subjects of other titles, but Della was never so honored.) Oberved by Notcom, 060916. There's a great shot of Fremont Street in Vegas --- before the canopy over the street was installed. jfh 25Jul2018. When her husband falls down drunk, Ellen asks the team to do what you should never do from someone with a drinking problem, namely, clean him up and put him to bed. Then to compound the problem, she asks the coach to give him tranquilizers as they carry him to his berth. What were people thinking? Submitted by gracenote, 5/19/2011. How did Burt come into ownership of 10% of the team? The Summary claims that �Perry actually runs as he and Paul chase a shadoway figure,� but in fact that is probably Lee Miller, Burr�s stand-in, who jumps out of the bushes. It�s kind of confusing because it appears to be Sgt. Brice who is doing the chasing at first, and then it becomes Perry Mason. Submitted by graceote, 5/19/2011. + Paul also runs and it actually appears as if it's actually William Hopper doing his own running --- and doing a mighty fine job of it! jfh 25Jul2018. Speaking of Sgt. Brice, the producers gave Lee Miller a little tribute in this episode. In a moment unrelated to anything in the script, Sgt. Brice drops by the table in Clay's Grill where Perry, Paul and Della are sitting and flirts a bit with Della. A brief and most charming gesture. Submitted by francis, 3/28/13. In the opening scene I expected to hear the conductor call out "Anaheim, Azusa, and Cu----camonga!" The Wildcats will play before a very large crowd in the Los Angeles Memorial Coliseum. Earlier, their return trip to LA started from somewhere north of Salinas (like San Francisco?). Given their prosperity and evident length of the trip, why did they go by train rather than by plane? This was of course necessary for a nifty if far-fetched plot contrivance, and it reminded me of "Double Indemnity" -- "He'll have to go by train." Submitted by (lowercase, with a comma and period) masonite, 07/07/13. This episode, as in #241 Mischievous Doll, depends on how the Los Angeles police identify a burned body. However, unlike #241, this episode's body is not the remains of a comparative nobody but of a co-owner of a major professional football team. Given the notoriety, why aren't the police more careful and thorough in their identification? Submitted by (lowercase, with a comma and period) masonite, 07/07/13. + The identification, you might recall, was based on a number of factors - the presence of personal effects, the statements of witnesses, and (presumably) a physical resemblance of the remains to Burt - which in real life would be accurate 999,999 times out of a million; so whether/not they would - or more importantly whether/not they should go further, is debatable. Of course in this perryllel world, the absurd, one-in-a-million can be counted on to happen. Defended by Notcom, 060916. Perry's theory for how the fire started could easily have been checked by examining the train compartment. "The Birlstone Gambit." The solution to the crime is a variation on what has come to be known as "The Birlstone Gambit," for its original use in one of Sir Arthur Conan Doyle's more famous Holmes stories. Ellery Queen employed it in several EQ and Drury Lane novels in the 1930s, as did ESG in "The Case of the One-Eyed Witness." Unfortunately, the gambit has become such a staple of whodunit fiction that it no longer manages to surprise mystery buffs. Submitted by BobH, 20 February 2017.